We’ve scoured the area for libations you’ll love. Why We Dig It: Authentic Mexican cuisine with many dishes coming from owner Marco Ramos’ own family recipes, at Casa Ramos the margaritas are strong and sizzling hot plates of steak, shrimp or pork fajitas will hit the spot. Get Mexican Pizza and Chicken Taquito appetizers for just $4.99. Experience a true taste of Mexico without leaving the Foothills. Casa Ramos, 6840 Green Leaf Court, Placerville, 530-622-2303, casaramos.net. Why We Dig It: With dozens of beers on tap, plus fresh, brick-oven-baked pies and $1 off draft beers and wines by the glass, everyone can gather around for a good time. Save room for cheesecake, it’s divine! Brick Oven Pub, 2875 Ray Lawyer Drive, Placerville, 530-622-7420, brickovenpub.com. Why We Dig It: In true vineyard fashions, Cellar Wine Bar is the ultimate tasting room, exuding a warm ambience with wine barrel tables, comfy booths and table seating, plus a large bar. 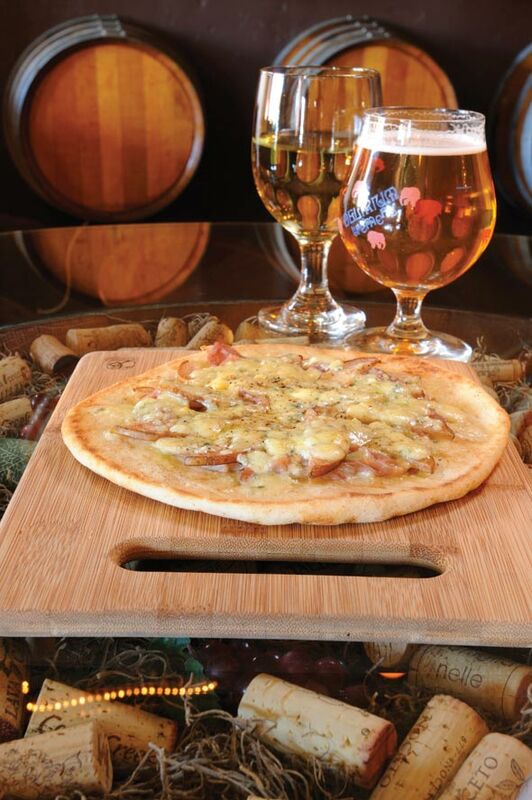 Taste a variety of local and regional wines like Lincourt Chardonnay and Miraflores Zinfandel, and artisan cheeses including Manchego Humboldt Fog and Beehive Cheddar, or opt for an IPA and a Prosciutto and Pear Pizza. Gather in the cellar and savor superb wine country fare in a cozy atmosphere. The Cellar Wine Bar, 3907 Park Drive, Suite 110, El Dorado Hills, 916-933-3103; 727 Sutter Street, Suite B, Folsom, 916-293-9332, thecellarwinebar.com. Why We Dig It: For seafood and steaks, look no further –searing perfect cuts of meat is their specialty. Drop in for Happy Hour and take advantage of well drink specials. An old-fashioned interior featuring a central fire pit adds to the rustic charm. With a well-stocked bar and steaks and seafood cooked to perfection, you’ll have an experience worth fifty grand. Fifty Grand Steakhouse, 6401 Pony Express Trail, Pollock Pines, 530-644-1580. Why We Dig It: An upscale-casual eatery in the La Borgata Center of El Dorado Hills, Sienna’s sophisticated interior with plush seating and an eclectic appetizer menu featuring Chipotle BBQ Pork Tostadas, Wild Mushroom Bruschetta and Thai Chicken Spring Rolls, offers something for even the most discerning palette. 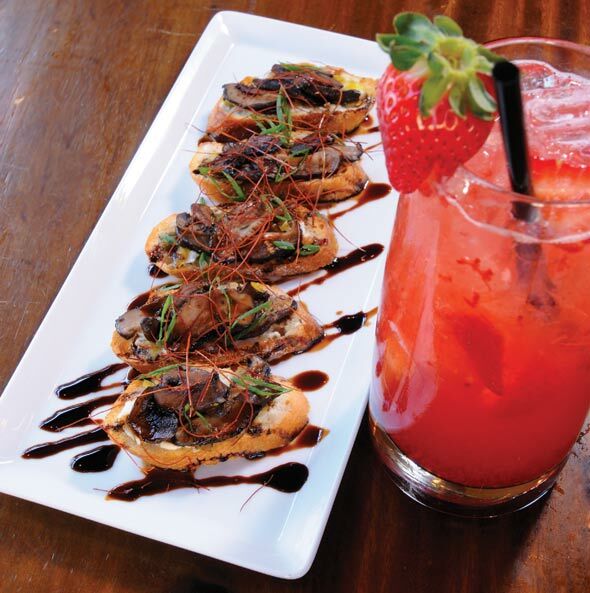 Try a Sparkling Strawberry Cocktail, a Sweet Serrano Chilitini, or Sienna’s signature White Peach Sangria. Cheers! Sienna Restaurant, 3909 Park Drive, El Dorado Hills, 916-941-9694, siennarestaurants.com. The Deal: Monday-Friday, 3 to 5 p.m., $4 pints, Wednesday (after 5 p.m.) $3.50 pints, Sunday 23-ounce beers $4.25, different food specials throughout the week. Why We Dig It: This family-owned brewpub has been crafting great beers and smoking Texas-style BBQ since 2005. Their beers are brewed with classic California Ale yeasts. A good time and great services are always on tap. Pull up a barstool, order a round of pints (we recommend trying Placerville Brewing Company’s Tangerine Ale or their Whiskey Barrel Aged Ales) and ask about food and appetizer specials. Placerville Brewing Company, 155 Placerville Drive, Placerville, 530-295-9166, placervillebrewing.com.